Hello lovely foodies! How are you all? Yesterday was the day of Guru Purnima; the Teacher’s Day of India! How you all celebrated the day? We have Satya Narayan Puja in our place and also my mom worshiped her Gurudev (religious teacher), who gave her the ‘Gurumantra’. I cooked so many vegetarian dishes Yesterday and we have eaten vegetarian (‘Niramish’ in Bengali) dishes in all the day. Today, I’m going to share a recipe from my veggie-kitchen, that’s - Dhokar Dalna! Dhokar Dalna is one of the traditional ‘Niramish’ (Vegetarian) dishes in Bengali Cuisine. 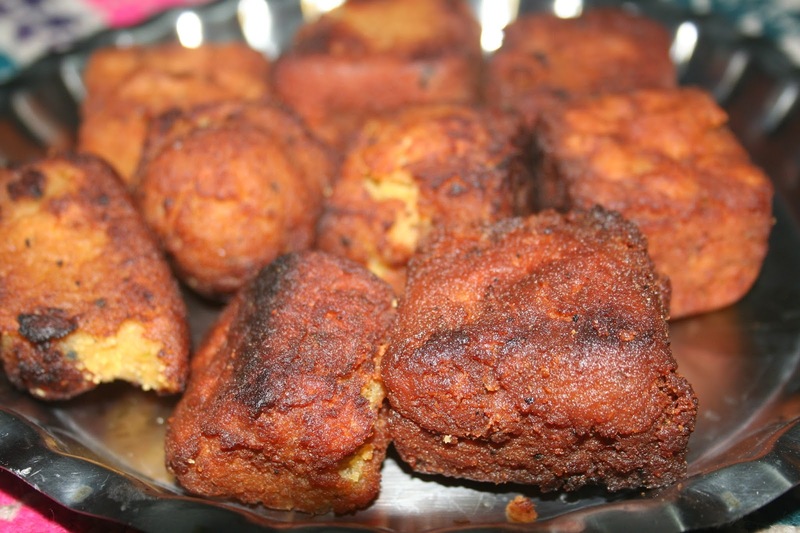 The lightly spiced lentil cakes or dhoka are fried and then simmered in gravy made with potato. We Bengali are very strict to call a dish ‘vegetarian’! We are not allowing even onion, garlic to vegetable family! Funny, right? But it’s true! So, in Dhokar Dalna, there are no place to add onion or garlic. The actually meaning of ‘Dhoka’ is "to cheat" and it is known by almost all the Indians; but I don’t know, why this delicious lentil cakes are named like this! 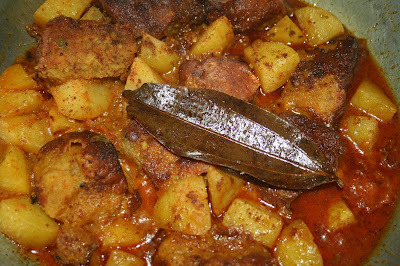 Dalna is a central part of Bengali cuisine. It is cooked in medium thick gravy; seasoned with ground spices, especially Garam Mashala and a touch of Ghee. It can be cooked with vegetables or eggs. It's still an unknown fact that who first created the dish- 'Dhokar Dalna'. Wash and soak Chana Dal in water overnight. Wash again the dal before cooking and drain the water. Take the dal with green chilies, salt, ginger and grind to a fine paste. Add little water if need. In a non stick pan, heat oil and temper with Black Cumin seeds and Hing. Fry for couple of seconds. Now add the grinded dal paste and sugar in it. Stirring continuously to avoid the dal getting struck to the sides. Cook until the mix comes off the sides clean. 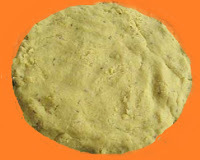 The dal should be cooked until it becomes soft but not runny or hard. Once it is cooked, spread to a greased plate as a 1 1/2 inch width cake. Cut the cake into 2 inch square or diamond shape dhoka. 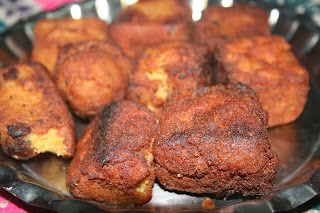 Heat the oil in a kadai and deep fry the lentil cakes till they become golden brown on both sides. Peel and chop the potatoes into small pieces. Wash them and keep aside. In a cup, mix the curds with Coriander Powder, Cumin Powder, Kashmiri Red Chili Powder and turmeric to make a fine paste. Keep it aside. Deep fry the potatoes with salt and turmeric powder in the same oil that you used for frying the lentil cakes. Keep it aside. Now temper the Oil with Bay leaf, Cumin Seeds and a pinch of Hing. Add the ginger paste and tomato in it and saute till tomato is well cooked. Add the curd paste, salt and sugar to the Kadai and mix well. Cook for 2-3 min. at low heat. Add the fried potatoes in it; mix well and cook for 2-3 min. Now add about 1&1/2 cups of water and mix well. Cover the kadai and cook till potatoes are done. Adjust for any seasoning, add a pinch of sugar. Next add Garam Masala and Ghee and gently mix. After the potatoes are well cooked; gently add the pieces of dhoka or the fried lentil cakes. You may add some water, as the dhokas will absorb water. Cover it for couple of minutes to let the dhoka soak up the gravy. 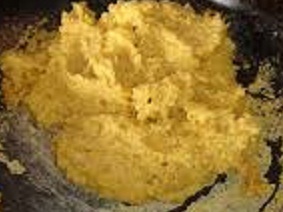 Remove the cover and add the ghee and Garam Mashala powder. Serve hot with smoked rice or rotis. * Using a non stick pan for sautéing the dal paste; it works the best! ** The ‘Dhokar Dalna’ tastes best with smoked rice.